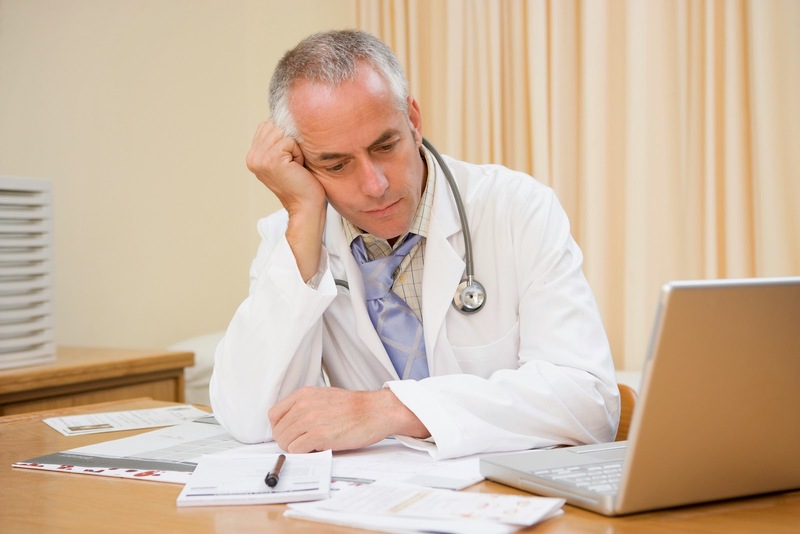 Dr.Malpani's Blog: Is technology dumbing down doctors ? The new generation MRI machines and 4-D ultrasound scanners provide us a window into the human body which no amount of poking and prodding would ever allow us to do . Because these gorgeous images give us so much information about what is happening to the patient , the problem is that doctors are no longer willing to spend time and energy in doing a clinical examination in order to make a diagnosis. When a neurologist can find out what is happening in the patient’s brain by doing an MRI scan , then why should be waste 45 minutes in doing a detailed neurological examination before referring the patient for the scan ? Isn’t it much easier for him to interpret the scan rather than do a clinical examination from head to toe ? Hasn’t that become obsolete in this day and age ? The problem is that this “shortcut” approach means that doctors tend to become lazy . Their clinical skills atrophy . In order to make a diagnosis of anemia , rather than look at the colour of the nail or the conjunctiva, they find it much easier to just order a CBC. And they can easily justify this course of action. Not only will the CBC report be much more accurate and reliable ( because it is objective), it will tell you what the exact hemoglobin level is – and even give you clues as to what the cause for the anemia is ! Doesn’t it make sense to use lab and imaging technology , so that you can help the patient more efficiently ? The answer is yes – and also no ! While images , lab test results and scans provide useful information , the fact of the matter is that we do not treat images and lab test results - we treat patients . The danger is that because we’ve become so focused on these investigations , we are starting to lose sight of the patient altogether . Sitting down and taking a history allows the doctor to understand the patient – his doubts, fears, and expectations of the consultation. However, technological intrusion gets between the doctor and patient and disrupts the doctor-patient relationship. There are some famous venture capitalists like Vinod Khosla who believe that machines will replace 80% of doctors. The reality is far more nuanced and complex ! It’s possible that technology may replace the clinical examination , so that rather than use a stethoscope to listen to a heart murmur, and then try to figure out what the diseased valve is ( an exercise which requires considerable skill, logic, experience and expertise), and then order to an echocardiogram to confirm your clinical impression, it's much easier to just order an echocardiogram , which gives you a far more elaborate and accurate of how the valves and working ; and to what degree they have been damaged. Thus, the appropriate use of technology can help the doctor to reduce diagnostic puzzles and cut down the amount of time they need to spend on doing a clinical examination . However, the easy availability of so much technology means that doctors are going to have to spend even more time talking to the patient. After all, the doctor still needs to decide which test is appropriate; in which sequence the tests need to be ordered; and he needs a clinical context in which to interpret the results. After all, the big difference between the technician doing the echocardiogram and the doctor is that the doctor is a clinician – he has to make decisions as to what the patient needs, while the technician needs to simply report the results his clever machine generates. ( who did not have scans to assist them) had developed over the years. Many of these “clinical signs” described in the textbooks of physical examination have become obsolete and irrelevant, and rightly so. After all, with the passage of time, we need to advance and acquire new skills. However, the danger is that if we spend so much time looking at scans and making sense of lab results, we may start forgetting that we are dealing with a human being . This would be a tragic loss . The magic sauce which doctors bring to medicine is the fact that they are human, and can interact with the patient on a one on one basis. A doctor does not just provide the patient with a diagnosis ( though this is often the most exciting and glamorous portion of medicine). He also provides the patient a shoulder to cry on – and this can never be replaced by a machine or a computer . They will use the clinical history to intelligently order tests, which they can then interpret correctly , because they are aware of the clinic context. They use their relationship with the patient , not only for diagnostic and technical purposes , but also to make sure that their patient can trust them. Sometimes doctors forget the basics. They get so enamored with the newest technology , that they often end up routinely over-testing all their patients. This produces a large number of incidental abnormalities, which the doctor then chases up even further – and he loses sight of the problem with which the patient first came to him to solve. Thus, many gynecologists find that they can get much more information about the patient’s pelvic anatomy by doing a vaginal ultrasound scan, rather than the old-fashioned pelvic examination. This is all for the best. However, which scan to do , and how to make sense of the scan results depends upon their ability to take a clinical history – and they cannot short cut this process.